The power of two products in one package – but to what end? We don't doubt its competence, but who needs its complexity? When it comes to Mac security, Intego is a veteran, publishing blogs and bulletins as well as producing software. It even has the dubious honour of being taunted by a line of malware code; high praise indeed. They have now combined VirusBarrier and NetBarrier (a personal firewall) under one banner. Enter VirusBarrier X6. We tested the Standard (two-user) version of VirusBarrier X6 on a 2.4GHz Intel iMac and a 2.16GHz MacBook. As ever with Intego products, installation was smooth, with a separate uninstaller provided. Taking a quick perusal of the available preferences, we set up trusted zones – that is to say, files and folders that don't need scanning (why scan your backup when it's already been scanned?). 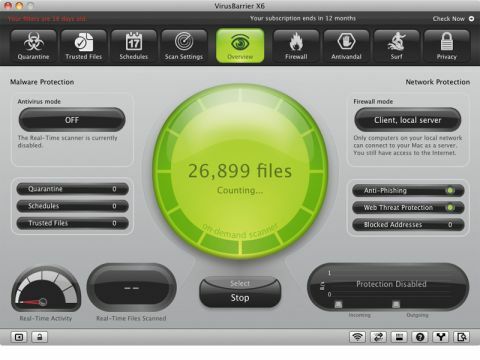 When we isolated both Macs from our network and introduced a selection of viruses to their hard disks, VirusBarrier responded with commendable alacrity. However, it needed directing to the actual files when the same viruses were inserted on a USB flash drive (a common source of infections), unlike Norton AntiVirus, which routinely takes a more aggressive approach. We'd have to say that in combining features of VirusBarrier and NetBarrier, Intego has over-egged the pudding, producing a product that's over-complex for the general user. A free product such as ClamXAV plus judicious changes to Mac OS X's own settings would work for most of us.